There are more than a handful of quality and useful plugins you can choose from. And today here at ThemeGrill, we have made the whole process easier for you. The options we have mentioned today each is built with a specific purpose, but surely aids to adding the file upload functionality. So without further ado, let’s get onto the listing. One of the best form builder plugins we have come across so far, Everest Forms is an efficient way to add file upload option on your site. With easy to use Drag & Drop form builder, you can create as many forms as you require. The forms created are completely responsive, retina-ready and also supports the much-required file upload option. Perfect for any site owners who wish to add a way for their users to find and submit any type of files, Everest Forms is a great option. Although was, you can even extend more functionality including File Upload using their premium add-ons if you wish to. The great thing about this is that this plugin is also fully translation ready so that you can easily approach even your international audiences. Fully- responsive, mobile friendly & retina-ready. After installing and activating the plugin, you will find a newly added menu for Everest Forms on the Dashboard. Click on Add New and you will be redirected you to the page where you can start creating a new form. Now, as you can see, you can either start from a blank canvas or you can start with a pre-built template available. Name the new form and you can now go ahead and edit the form to your requirements. You will now be able to add, edit or remove any form fields that you might need with ease. Thanks to the easy drag and drop interface, it is simply a breeze. On the left-hand side, you can see the list of fields available for you to add. This includes various different elements including multi-choice, drop down fields, single line, and even File Upload. Now that you have created your very own form with File Upload option, go ahead and Save the changes. To display the form on your website, simply copy the shortcode and paste it on any pages or posts. User Registration is yet another amazing free WordPress plugin that is ideal for anyone looking to create amazing looking registrations for their site. Whether personal or professional, this plugin has variations to choose from to get that perfect result you wish for. The great thing about it is that it supports an unlimited number of forms. 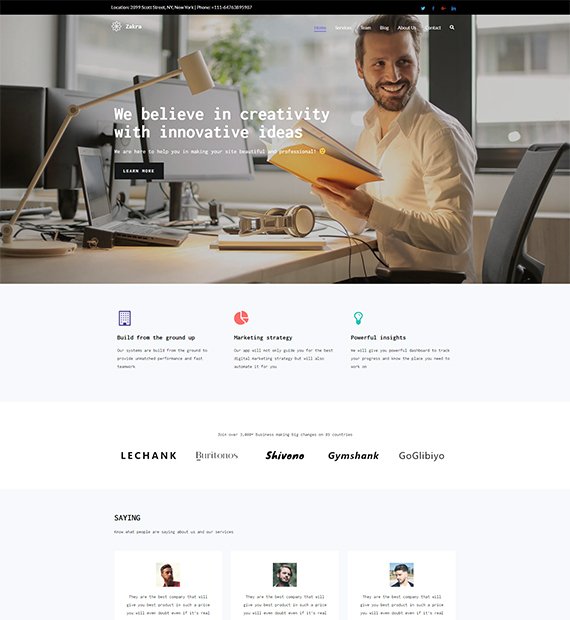 And it is also completely responsive and retina ready so that the forms automatically adjusts to every device screen size with ease. You can even create multi-part forms if you prefer. For additional features including File Upload, you also get access to a range of awesome premium Add-Ons that you can easily install. Supports an unlimited number of forms. Talking about the process of adding the File Upload option on your site, you first need to get the premium add-on File Upload. After installing and activating both the plugin and the add-on, you will find a new option on the Dashboard as User-Registration. Click and select Add New to redirect to the form customizing. Now that you are fully redirected, you can now see all of the fields available and the variations of forms that you choose from. Choose the type of form layout whether you want to go for multi-part or single part form and start customizing. Easily Drag and Drop any elements from the right-hand side to the forms. There are various fields including the File Upload amongst them. Once all the changes are made, go ahead and Save the changes. To add the form onto your site, simply go ahead the shortcode to any page, posts or even sidebars with ease. Another great form builder plugin that aids to the file upload feature is WPForms. Built with user-friendly options and easy to use Drag & Drop builder, it is ideal for even beginners to get started. Choose from various form templates and easily enable file upload options for your users to find. Even the most complex of forms are made easier with WPForms thus making it one of the best choice to opt for. Easily view all of the uploaded data and entries in one place making it easier to manage it all. The best part? You can also easily create subscriptions, manage email marketing and connect with your email marketing services with ease. File Upload options supporting any file type. Smart entry and upload management. Just like with the previous plugins, start by installing and activating the plugin WPForms. 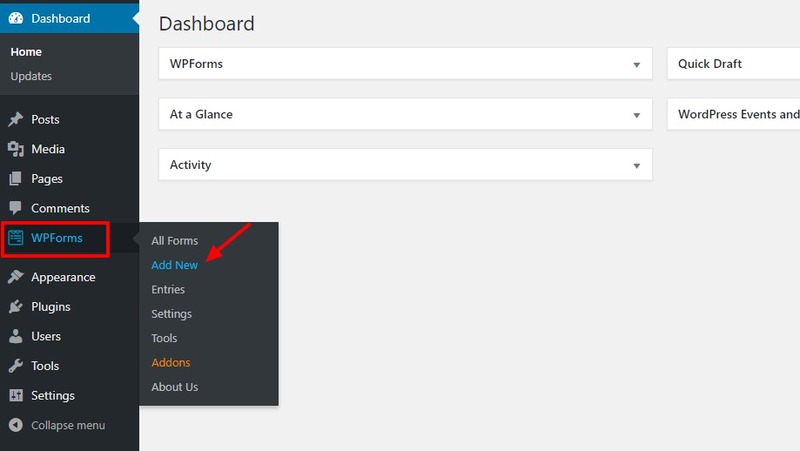 Once that is complete, you will find a new menu for WPForms on the Dashboard. Go ahead and then click on Add New. Here, you can see options for various settings related to the forms. Go ahead and name the form and select a template to start with. Once that is done, you will be able to see all of the fields available for you to start creating. Since we chose the blank template to start with, we can now choose the fields we want to add to our forms. As you can see that after enabling the pro version, there are additional fields available as well including File Upload. Once you are happy with the forms make sure to save the changes. Copy and Paste the shortcode to any page, or posts and enable file upload option on any of your WordPress site with ease. Talking about uploading content from the site’s frontend, this Free plugin is developed particularly for the purpose. That’s right, whether you want to add a way to add content for you, or your client, this plugin enables you to create highly customizable submission forms. Flexible and powerful, it provides the option to add shortcodes to create efficient and modifiable file submission forms. Once you add the forms, it is also easy to manage any submissions until you approve of it. You can add them on any related posts, pages, and even custom post types. Shortcode enabled forms and elements. Supports most file types including images, texts, radio buttons and more. Responsive, retina-ready and mobile friendly. Can be added on any posts, pages and custom post types. Unlike the previous alternatives, this plugin falls under a different niche as it is not a form builder. Instead, it provides option to add file upload directly on the front-end of your site. After installing and activating the plugin, go to Settings tab from the Dashboard and select Frontend Uploader Settings. This will redirect you to the settings page where you can now customize it according to your preference. There are options for spam protection, ReCaptcha, Admin ntofication, Author field, types of file to allow upload and more. Once you have changed the settings, the final step is to Save Changes. Another one on our list of the Best WordPress file upload plugin is WordPress File Upload. Ideal for those looking for a feature-rich free plugin, it enables users to easily add file upload options on your site from any page, post or sidebar. Add custom fields, capture screenshots or videos to upload, enable filters and much more. What’s more is that it can also produce notifications and emails. As it is translation ready, you can also change it to your native language as well. Managing the submissions are also a breeze as you can view it all in one Dashboard. Option to capture screen and upload image or video. 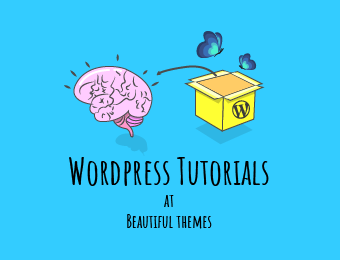 This is yet another simple to use plugin that allows users to enable file upload on their frontend and that too within a matter of few minutes. That’s right. To start, go to Settings from the Dashboard and select WordPress File Upload. This will redirect you to the setting page where you can modify the settings and enable the file upload option. After making the changes, scroll down below to the Uploader Instances. There you can also choose the uploader placement whether you want to add it on the pages, or posts. Once done, you can find the option for file upload on your site. And this concludes our list of the best premium & free WordPress file upload plugin collection. While some of these options provide the file upload option for free, some might requrie additional investment with the pro version or for additional add-ons. But more or less, we hope you now have the idea of how to add file upload option for your WordPress site. We do appreciate feedback, so why not let us know what you think about this post. Also leave a comment down below if you have any suggestions. And if you think this post was great, here are more of our plugin listings that you might enjoy! 8 Best WordPress LMS plugins to sell Online Courses! 10 Amazing Header Plugins For Sticky, Animated & Creative Headers! 8+ Stunning WordPress Timeline Plugins for 2019! Thank you so much for share this awesome article, I had researching for this a log time and find out this post was amazing and helpful.